Reading and share top 58 famous quotes and sayings about Coalition by famous authors and people. Browse top 58 famous quotes and sayings about Coalition by most favorite authors. 1. "Research promoted by NARA within a major coalition of Federal and private sector research partners has at last demonstrated that an Electronic Records Archives can be built." 2. "But for 30 years, Orthodox leaders have tipped the balance between hawks and doves, and have been in a position to determine who forms a coalition and who runs the country." 3. "In any country, governance issues are there. Challenges are there, pressures are there. When multi-party coalitions take decisions, sometimes delays will be there. But that is what democracy is: it is beauty or it's challenge." 4. "In the German football team players from different clubs need to get on with each other both on and off the pitch. In the grand coalition Christian Democrats and Social Democrats sit in the same boat and need to pull in the same direction." 5. "First Amendment freedoms are most in danger when the government seeks to control thought or to justify its laws for that impermissible end. The right to think is the beginning of freedom, and speech must be protected from the government because speech is the beginning of thought. "[Ashcroft v. Free Speech Coalition (00-795), 198 F.3d 1083, affirmed.]" 6. "FDR created today's 30 percent coalition. Obama wants to finish the job by turning it into a permanent ruling majority. There's nothing new about the Obama Narrative. It is the FDR Narrative on steroids. It is intended to lead to greater statism and political gain." 7. "Any coalition has its troubles, as every married man knows." 8. "America must continue diplomacy, even as we continue the war, to expand the coalition of the willing to share the burden of war and to share the responsibility and the economic cost of rebuilding Iraq." 9. "Politically progressive black people on the Left who are not nationalist, like myself, share a perspective that promotes the eradication of white supremacy, the de-centering of the West, redressing of biases, and commitment to affirming black self-determination. Yet we add to the critique of white Western imperialism a repudiation of patriarchy, a critique of capitalism, and a concern for interracial coalition building." 10. "Last century we needed lawyers; this century we need big, broad coalitions. When extremists decide to attack all our communities, they must hope that there will be infighting. But we have stood all for one and one for all. That is how we will win." 11. "They came down on us because we had a grass-roots, real people's revolution, complete with the programs, complete with the unity, complete with the working coalitions, where we crossed racial lines." 12. "The man breeds lies. He spawns them asexually, with no need for any assistance. He exhales and lies fill the air. Alone in a room, he mutters lies to himself to keep from falling into the trap of truth-telling. In the day, sleeping in his bed, deep in the safest heart of Coalition headquarters, he dreams in lies. The better to keep his left hand from knowing what betrayals his right has planned." 13. "It's not that fact of him telling me he's not going to kill me that assures me I've got some time to breathe. Predo could look me in the eye and tell me whiskey's good and cigarettes are better and I'd still need a drink and a Lucky to believe he's not lying. The man breeds lies. He spawns them asexually, with no need for any assistance. He exhales and lies fill the air. Alone in a room, he mutters lies to himself to keep from falling into the trap of truth-telling. In the day, sleeping in his bed, deep in the safest heart of Coalition headquarters, he dreams in lies. The better to keep his left hand from knowing what betrayals his right has planned.Stretched on the rack and burned with hot irons, Dexter Predo will be in no danger of revealing the truth. Living so far beyond its borders." 14. "The art of coalition command - whether it is here in Afghanistan, whether it was in Iraq or in Bosnia or in Haiti - is to take the resources you are provided with, understand what the strengths and weaknesses are and to employ them to the best overall effect." 15. "Many historians have noted an interesting phenomenon in American life in the years immediately after a war. 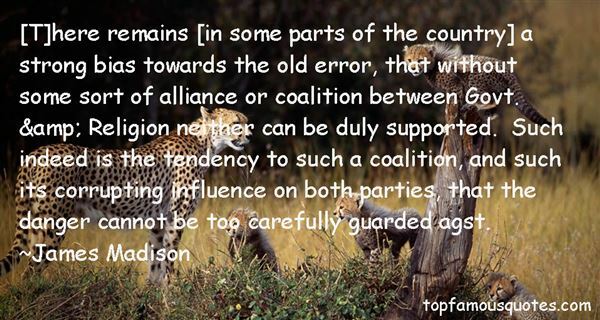 In the councils of government fierce partisanship replaces the necessary political coalitions of wartime. IN the great arena of social relations -- business, labour, the community -- violence rises, fear and recrimination dominate public discussion, passion prevails over reason. Many historians have noted this phenomenon. It is attributed to the continuance beyond the end of the war of the war hysteria. Unfortunately, the necessary emotional fever for fighting a war cannot be turned off like a water tap. Enemies must continue to be found. The mind and heart cannot be demobilised as quickly as the platoon. On the contrary, like a fiery furnace at white heat, it takes a considerable time to cool." 16. "Since the presidency of Ronald Reagan, conservatives have succeeded by adhering to a platform that rests firmly on three legs: smaller government, faith and family, and a strong national defense. These three legs do not merely represent a political coalition; they are three necessary components of a strong and secure America." 17. "The elves had a coalition agreement with the school, the head elf had said. It almost sounded like they'd unionized, and that an essential rule of the elf union was that only elves did elf work. Perhaps they viewed it as job security. James wasn't sure if Aunt Hermione would view this as an improvement or a setback." 18. "We'd never seen anything as green as these rice paddies. It was not just the paddies themselves: the surrounding vegetation - foliage so dense the trees lost track of whose leaves were whose - was a rainbow coalition of one colour: green. There was an infinity of greens, rendered all the greener by splashes of red hibiscus and the herons floating past, so white and big it seemed as if sheets hung out to dry had suddenly taken wing. All other colours - even purple and black - were shades of green. Light and shade were degrees of green. Greenness, here, was less a colour than a colonising impulse. Everything was either already green - like a snake, bright as a blade of grass, sidling across the footpath - or in the process of becoming so. Statues of the Buddha were mossy, furred with green." 20. "Here, I am looking for a document issued by a public attorney. I don't find. He is accused by the political leaders of the coalition, by his enemies, who said that he is guilty. That he deserves to be killed." 21. "[T]here remains [in some parts of the country] a strong bias towards the old error, that without some sort of alliance or coalition between Govt. & Religion neither can be duly supported. Such indeed is the tendency to such a coalition, and such its corrupting influence on both parties, that the danger cannot be too carefully guarded agst." 22. "It may not be easy, in every possible case, to trace the line of separation between the rights of religion and the Civil authority with such distinctness as to avoid collisions and doubts on unessential points. The tendency to usurpation on one side or the other, or to a corrupting coalition or alliance between them, will be best guarded agst. by an entire abstinence of the Govt. from interference in any way whatsoever, beyond the necessity of preserving public order, and protecting each sect agst. trespasses on its legal rights by others. [Letter to the Reverend Jasper Adams, January 1, 1832]"
23. "I was proud to witness American Jewish organizations found the Save Darfur Coalition in June 2004 to mobilize a coordinated interfaith response to the ongoing humanitarian disaster." 24. "I see myself as a small 'l' liberal, but not coalition liberal, necessarily." 25. "You win by working hard, making tough decisions and building coalitions." 26. "Nonetheless, Article 5 makes clear that if an Iraqi civilian who is not a member of the armed forces, has engaged in attacks on Coalition forces, the Geneva Convention permits the use of more coercive interrogation approaches to prevent future attacks." 27. "The people of Iraq are grateful for what the people of the United States of America and our armed forces and our coalition forces are giving them the opportunity to do." 28. "Yesterday, the president met with a group he calls the coalition of the willing. Or, as the rest of the world calls them, Britain and Spain." 29. "I argued that the Bush administration, and the Coalition officials more recently, didn't understand Iraqi society. They thought it was a blank slate, that they could use Iraqis as guinea pigs." 30. "Organizing a working majority proved harder than we thought because we couldn't get a quorum. But one day in December, twelve people showed up, eight from our coalition. So we changed the quorum to eight. You gotta do what you gotta do--this was war, one faction against many others who wanted control of the land." 31. 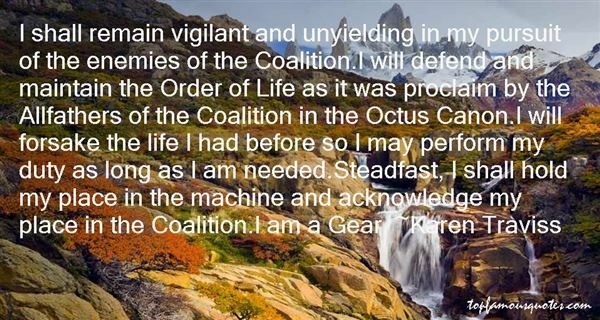 "I shall remain vigilant and unyielding in my pursuit of the enemies of the Coalition.I will defend and maintain the Order of Life as it was proclaim by the Allfathers of the Coalition in the Octus Canon.I will forsake the life I had before so I may perform my duty as long as I am needed.Steadfast, I shall hold my place in the machine and acknowledge my place in the Coalition.I am a Gear." 32. "The Coalition for International Justice estimated that 450,000 people in Darfur have died since the deadly genocide began some three years ago." 33. "Since September 11, 2001, the powerful coalition of nations, led by the United States, has seen many successes against al-Qaeda and other terrorist groups. It is imperative that we remain united and steadfast in the quest to defeat terrorism around the world." 34. "[Stephen] Harper had said he would use all legal means, and what [John] Baird suggested was an option the prome minister was considering. If the governor general had refused his request, he could have replaced her with a more compliant one, making the case to the Queen that the people of Canada were opposed in great numbers to a coalition replacing his government." 35. "I'm a part of the no-tight-jeans coalition." 36. "We are a coalition government, and that limits our options in some ways. Privatization happens to be one such area." 37. "The usual fiction – that the war would involve precision targeting and the careful avoidance of civilian deaths – was stated by Tony Blair at the beginning of the war. After similar bombing campaigns against Yugoslavia and Iraq, Blair was by now acting as virtual White House spokesperson, providing the pretence of an 'international coalition' in what was clearly a US war. This role was more important than Britain's military contribution, which in the early days of the bombing campaign was token and probably of no military value. The British army did later prove useful, however, when it was..."
38. "He was able to find the intensity and beauty that he wanted, in the plung itself. Physical forces in a complicated coalition of gravity, acceleration, and temperature were powerful and intense enough to satisfy him. It made sense. Nothing was as comforting as the enduring purity of elemental forces, and returning to them could not mean defeat. But he never thought that he would die in a bark suit, strapped to a shock pancake, next to an incompetent midget." 39. "A coalition with Tories and Liberal Democrats together is a golden opportunity to create the sort of planning reform that means not only can we have more environmentally sensitive planning, but we can have more homes and more schools." 40. "The president led us into the Iraq war on the basis of unproven assertions without evidence; he embraced a radical doctrine of pre-emptive war unprecedented in our history; and he failed to build a true international coalition." 41. "As the Iraqi people better understand that Saddam Hussein and his regime are history, it is my hope that they will get behind the coalition effort to help them create a democratic government and rebuild their country." 42. "Of course, running a coalition government in a country like India is a difficult task. More so when Congress leads the coalition, since most of the political parties were anti-Congress. To have a coalition, to run a coalition government, you require a lot of adjustments, a lot of flexibility." 43. "We've had Saudis and Jordanians and Pakistanis who have - and Syrians - who have been involved in armed attacks against coalition forces in Iraq." 44. "Stephen Harper, who's the prime minister of Canada, he is saying that this - we have to give him a majority government, otherwise there will be a Separatist coalition. And he says it every minute." 45. "And under our system, much like you see in the U.K., of course, a party working with another party can form a coalition and govern the country." 46. 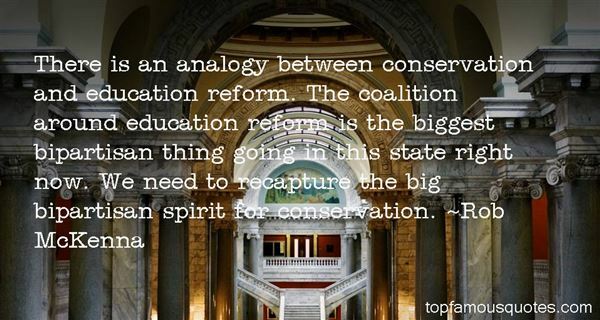 "There is an analogy between conservation and education reform. The coalition around education reform is the biggest bipartisan thing going in this state right now. We need to recapture the big bipartisan spirit for conservation." 47. "My hope is that out of all the anger and seeming hostility that we hear in some of today's music will come some sort of coalition that will become politically involved." 48. "It's tough and it should be tough - it should never be easy to be given millions of pounds to make a drama. The coalition government is doing terrible things to the BBC, but drama will survive even if we end up putting on a play in a backroom of a pub." 49. "The more women help one another, the more we help ourselves. Acting like a coalition truly does produce results. Any coalition of support must also include men, many of whom care about gender inequality as much as women do." 50. "Which is why Slothrop now observes his coalition with hopes for success and hopes for disaster about equally high (and no, that doesn't cancel out to apathy—it makes a loud dissonance that dovetails inside you sharp as knives). It does annoy him that he can be so divided, so perfectly unable to come down on one side or another. Those whom the old Puritan sermons denounced as "the glozing neuters of the world" have no easy road to haul down, Wear-the-Pantsers, just cause you can't see it doesn't mean it's not there! Energy inside is just as real, just as binding and inescapable, as energy that shows. When's the last time you felt intensely lukewarm? eh? Glozing neuters are just as human as heroes and villains. In many ways they have the most grief to put up with, don't they?" Therefore in medicine we ought to know the causes of sickness and health."